NASCAR has enjoyed a lot of success over the last two decades, it has gone from a niche sport to a mainstream sport with millions of fans all over the world. Like every other sport, NASCAR is getting to the point where some of the stars that helped make the sport as popular as it is today will soon be retiring. The retirement of some of its stars will affect online NASCAR betting, but with a new generation of stars waiting in the wings, NASCAR will be just fine. With the eventual retirement of some of its biggest stars coming up, some are starting to wonder which of the new generation of drivers will carry the torch and take the sport to the next level. The question of which drivers will take up the mantle as the face of the sport is an important one, because attendance has been slipping in some events and the sport will need help from the younger drivers to continue its success. The drop in attendance could be seen at Bristol Motor Speedway last Sunday where the 150,000 capacity track that had been sold out for decades was only half full. This week’s Sprint Cup event at the Richmond International Raceway is also going to have a lot of empty seats as the 115,000 capacity track has only sold 60,000 seats. One of the reasons for the recent drop in ticket sales is the fact that one of the most popular drivers over the past two decades, Jeff Gordon, retired last year. Another popular driver Tony Stewart has been dealing with a back injury that forced him to miss a lot of races last year. Stewart announced that this would be his last season because the injuries have started to take a toll on his body. Both Gordon and Stewart are 44 years old, and have had very successful careers, so their retirement is understandable. Other drivers like six time Sprint champion Jimmie Johnson have hit 40, and drivers like Matt Kenseth, Kevin Harvick, and Dale Earnhardt Jr., are on the verge of turning 40, or are over 40, so they are also going to be contemplating retirement soon. Since all these drivers will be hanging it up in the next five years, it’s time to take a look at the next generation of drivers that are expected to take their place. 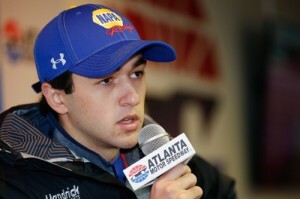 The driver most consider the next big star in the sport is Chase Elliott, the 20-year-old Xfinity Series champion who has taken over Jeff Gordon’s #24 Chevrolet as a member of Hendrix Motorsports. Usually, when a young driver takes over for a legend, there are some that can’t handle the expectations of driving the legend’s car. In Elliot’s case, he was bred for this moment because his father, Bill Elliott, was a great driver, winning 44 races and he was also the 1988 Sprint Cup Champion. With that sort of pedigree, Elliot should be able to handle the scrutiny and expectations that come with driving the #24 Chevy. Trevor Bayne, a 25-year-old that finished 5th at Bristol is also considered one of the upcoming stars in NASCAR, as are Ryan Blaney, 22, and Chris Buescher, 23. These three drivers have experienced some success on the tracks, and have been able to get the most out of their cars without the sponsorship of a major group like Hendrix. Some people might be doubtful that these young stars are capable of keeping NASCAR’s popularity going, but you have to remember that the same was said about drivers like Gordon and Stewart, but they ended up doing more than anyone ever imagined for the sport.